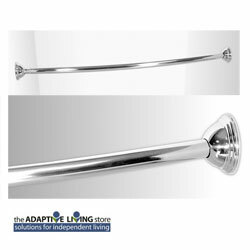 Adjustable Curved Curtain Rod with Hardware, 43" to 72"
The Curved Curtain Rod is adjustable from 43" to 72" Showers and has a choice of three different finishes. Includes mounting hardware and instructions. Please note: Seasonal Lead Times are currently 2-3 weeks Production. Please contact an Adaptive Living Store representative for current lead time. This item is delivered via Ground if purchased separate from Shower Unit.